Users might want to remove the background from an image for different reasons. If you’re selling things online, creating presentations, or even making collages, you can remove the background to highlight the object of the photo or to remove the distracting details. Instead of trying to accurately enclose a region with the Lasso or Magic Wand tools in Photoshop, you can easily remove the background with these web apps. The bonus being they’re either free or affordable for most people. ClippingMagic is a simple web app to remove the background from any image. When you navigate to the homepage, you’re immediately presented with the upload options. Click the Upload Image button to upload the photo from your computer. When it’s done, you’ll see two adjacent panels with your image on the left and a blank panel on the right. Use the green tool (+) to mark the object and red tool (-) to mark the background of the image. You don’t have to precisely mark every edge of the object, show the app what you want to keep, and the tool will do the rest. As you mark the object and the background, the right panel shows you the results in real time. In areas where the edges are too faint or noisy for the algorithm, click the scalpel tool to manually adjust the clips. Then, click the Review button to inspect the image in detail and apply touch up marks if needed. You can always undo edits or choose Edit > Clear all marks to start from the beginning. ClippingMagic also offers several tools to let you further refine the image. You can add drop shadows, adjust the color, change the background color, fine-tune the edges, and much more. If you want to sell things online, then ClippingMagic lets you upload a large number of images and clip them in rapid succession. Be sure to set up the default settings, resolution, and crop settings before starting a bulk job. You can upload and edit any number of images, but to download you’ll need to subscribe. Check out the pricing page for further details. Since the uploading and processing of images takes a bit of time, you always need a constant internet connection to work with the app. FotoFuze is a specialized photography tool that removes the poor quality background from a photo with the white background in just a few steps. Click the new album button, type in the name, and start uploading your images. Once you upload the image, click the magic highlighter tool to highlight the object. 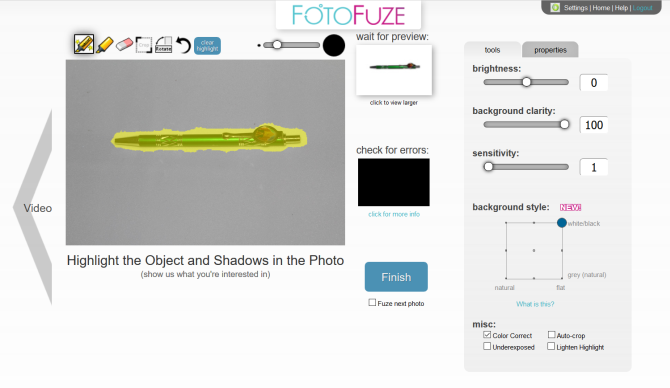 As you finish highlighting, FotoFuze will show you a mini live preview of the image. If your fuze didn’t come out as expected, then check the useful error overlay box. Areas marked in red often suggests that there were problems while fuzing the photo. FotoFuze also lets you color correct the image, fix exposure related problems, auto-crop the picture, and more. If the photo still doesn’t meet your expectations, try changing the background clarity, brightness, and sensitivity. Click the Finish button to fuze the picture. FotoFuze has built-in support for the Etsy platform. In addition to the image cleanup, you can create, update, draft, and copy your listing directly from the FotoFuze. You can fuze multiple photos without any delay, download high resolution photos, and much more with an affordable FotoFuze subscription. FotoFuze does not work correctly with textured or uneven backgrounds. It needs a gray, black, or texture-free background. PhotoScissors online is a free web app to remove the background from any image with just a few steps. Right away, you’ll see an Upload Image button to upload the image. The web canvas has two adjacent panels, with your picture on the left and a blank panel on the right. The app also guides you with a quick interactive tutorial for newbies. PhotoScissors uses the same selection mechanism as ClippingMagic. 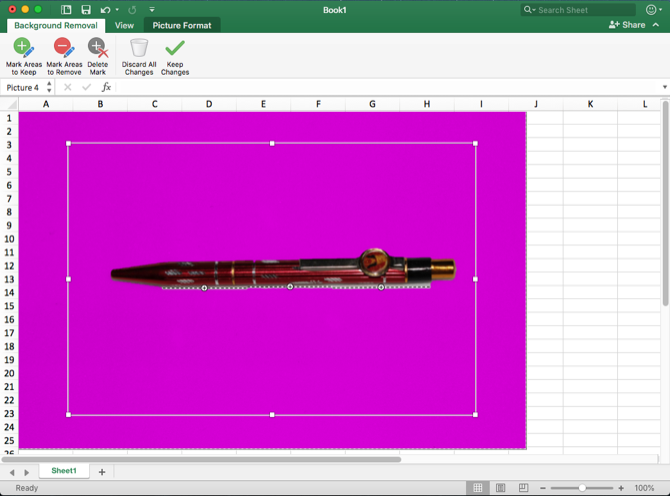 Use the green tool (+) to mark the object and red tool (-) to mark the background of the image. You do not have to carefully select the area, just ensure to put the green marker within the lines of the object you want to cut out. Once you mark the image, let the algorithm take care of the details. If you think you made a mistake, click the Undo button and repeat the procedure. The app also gives you the option to smooth and offset the boundary. You can swap the background with an alternate image or solid color, move the object, and add shadow effects. With just a few mouse clicks, PhotoScissors gives you reasonably accurate cut-out images. But where it lacks is precision. The online image editor lacks sophisticated tools to refine the image. Consider using these free web apps to edit photos. There’s also a limit on the image size and resolution. You cannot upload a photo bigger than 5MB or with a resolution of greater than 2.1 megapixels. To remove these restrictions and get more features, purchase the desktop app for Mac or PC. Background Burner is a free and intuitive web app to remove the background from any image. As usual, you start by uploading your photo to the app. It’ll then try to remove the background from your image automatically. Once finished, it outputs 3–4 copies of the processed images. Out of these, you choose the best picture. 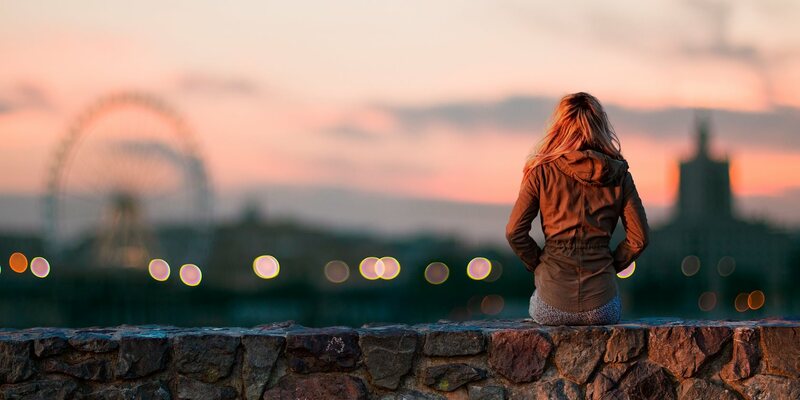 If the photo you uploaded isn’t complex, you’ll most likely find the perfect image. Click the Select button to download the image. The app also gives the option to touch up a nearly perfect image. Click the Touchup button to open the new editing window. Behind the scene, the app uses the ClippingMagic mechanism. You can choose from three brush sizes, undo the steps, and zoom images to mark them with precision. Then, click the Pixel Tools button to manually erase the background (or restore the foreground), or use the polygon shaped tools to fine-tune the edges. Background Burner does pretty much all the heavy lifting itself. Since the app is free to use, you can save both time and money. If you’re planning to remove the background from several pictures, then this app should be your first choice. When it comes to images that are a bit more complex, the automatic results are not as good in comparison to other apps. Background Burner lacks complex editing tools to fine-tune the images, bulk clipping mode, and custom settings. If you have Microsoft Office 2016 installed, you have another easy method to remove the backgrounds from images. The process is identical for Word, Excel, and PowerPoint. To get started, insert the picture into a document. Now choose Picture Format > Remove Background (in case of Mac). The app will then try to figure out the background, and mark them in purple. If the image is simple, it’ll easily cut out the background. For more complex images, use the Mark Areas to Keep and Mark Areas to Remove button to fine-tune the selection. The marker is not intuitive to use. It just lets you draw straight lines around the object you want to keep or get rid off. Once you’re done, click the Keep Changes button to save the image. If you’re looking for a quick way to remove the background from photos and that too offline, then Microsoft Office is the best choice. But you shouldn’t buy or subscribe to Microsoft Office just for this purpose. Also, the marking tools are a little hard to use, so they may not give you the best result on your first try. Removing background from photos is not an impossible task. Using one of the tools mentioned above, you too can remove the background from any picture without learning how to use Photoshop. These tools cover only one part of the process. If you fail to take good photos in the first place, then removing backgrounds might be more difficult. See our top photography tips for beginners and our guide to digital photography to learn the fundamentals of good photography.